thief, invoker, illusionist, and shaman. After the abyssals were banished with Zaikkra and his demon generals, many of their wounded escaped to the Material Abyss. Here, they met their untimely and unexpected end at the hands of their own familiars. Sensing their masters were weak, the quasits abruptly turned on them and reversed the servitude. They are not content to remain within the abyss, and regularly commune for the help of the lord of undead. For the fee of one abyssal soul per journey, Resatimm transports a quasit to Serin, finally free of their birth bond, and with a promotion of power to boot. 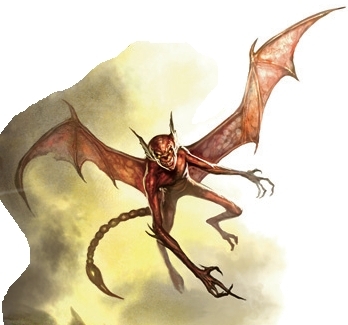 Quasits as they are usually found in the abyss realm have rarely been seen in Serin. Instead, what Serin meets are quasits that have overturned their masters. Fiercely free-willed and extremely dangerous, these small beings seek to entertain themselves, often by settling in urban areas where there are plenty of folk to torment. Many an adventurer's only saving grace when encountering a quasit is that they are consumate cowards. Consider using doppelganger and their ability to cause fear to confuse and vex the Justice cabal.